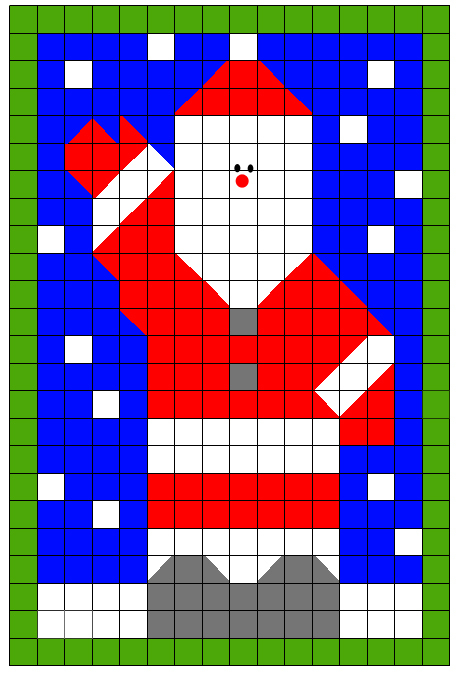 Out of boredom today, I decided to create my very own crochet quilt afghan pattern of Santa Claus for the Christmas holiday season. This pattern is untested so please let me know if you come across any errors. You may sell your finished product but you may not sell or reproduce this pattern in any way. If you would like to share this pattern with your friends, please do so by sharing the link to this web page only. Round 2 - Slip Stich in next 2 stitches, (sl st, ch 3, 2 dc, ch 2, 3 dc) in first chain space, chain 1 *(3 dc, ch 2, 3 dc) in next chain space, chain 1; repeat from * around. Join. Fasten Off. Round 2 - Join 1st color with slip stitch in last corner of chain space made, chain 3, slip stitch in 2nd ch from hook (joining loop made), 2 dc in same corner chain space, ch 1, (3 dc, ch 2, 3 dc) in next corner chain space, chain 1, 3 double crochet in next corner space, chain 1 changing to 2nd color, chain 1, 3 dc in space chain space, chain 1, (3 dc, ch 2, 3 dc in same corner chain space as 1st 3 double crochet, ch 1, join with slip stitch in joining loop. Fasten off both colors. Arrange squares according to illustration below. Be sure to use colors to match the edges and sew the squares together in the back loops. Add a border of your choice if desired. Embroader outlines as shown below with black yarn and tapestry needle. Crochet a red circle and attach it to afghan to make Santa's nose. Do the same with black to create 2 eyes. I don't understand how to do the squares that look half black/red because your instructions doesn't look like a 1/2 a color. If you understand what I am saying. Shouldn't you work 1/2 the color in black then pick up white and finish row 1 pick up 1st color and then finish in 2nd color. Thank you for pointing out this error. It's been corrected. Flower Crochet Quilt Afghan - Free Pattern! !